2002 02 KAWASAKI ZX-6R ZX636A - Low mileage! 2002 (02) Kawasaki ZX-6 - Clean example - Low mileage - Here at SoManyBikes we are committed to bringing our customers the best finance deals. Thats why we offer low rate finance with a low deposit, with an extended warranty and even poor credit finance! We carry a huge range of stock with competitive prices, full parts and labour warranty packages (that actually work!) and hassle-free, friendly service. Have your new bike delivered by our professional and affordable transport service - www.moveamotorbike.com. Visit www.somanybikes.com or call our friendly staff on 0161 713 3219 for help and advice on your next bike! 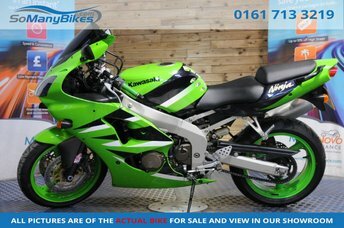 Looking for a great price on a used Kawasaki ZX-6R in Royton, Oldham? Here at CarBay Limited you'll always be able to source an exceptional range of quality second-hand motorbikes, all affordably priced and fully inspected. The Kawasaki ZX-6R offers stunning looks, a powerful 599cc engine and offers a great way into the world of mid-weight sports bikes. Our team is here to help you find the perfect used bike to suit both your budget and riding needs, so be sure to get in touch to discuss your requirements in more detail. You can view all of our stock here on the website, before contacting the showroom to arrange a test ride on the model of your choice.